A lively collection of favourite fairy tales that's guaranteed to give little ones the giggles. Celebrating 10 years of this timeless collection of Aesop's favourite tales, retold by Michael Morpurgo - author of War Horse - and illustrated by renowned artist, Emma Chichester Clark. Taking inspiration from the author's brilliant characters, fire your imagination and get your creative juices flowing with this boredom-busting activity journal, and complete with space to record your ideas every day. All the foul facts about the Vile Victorians are ready to uncover, including the murderers who wouldn't hang, when the first public loo was flushed and how stag hunting took place in Paddington Station. These bestselling titles are sure to be a huge hit with yet another generation of Terry Deary fans. In the visual arts of fifteenth to the early nineteenth centuries in Europe, animals were understood in relation to the human world, whether as animals of the farm, estate or household, beasts of burden or as diversions in menageries and travelling shows. This book explores perceptions of natural world as seen through eyes of imaginative artists. Crack the code to your future dreams Since 2012, the organization Girls Who Code has been leading the charge to get girls interested in technology and coding. Includes short and accessible facts about each artist's life and works that are followed by creative projects that Marion has devised based on the artist's particular techniques. Featuring 20 detachable postcards with fingerprint characters, this book is an appealing gift for all ages. The must-have survival guide for all young explorers from chief scout, adventurer, writer and televsion presenter, Bear Grylls. Embark on an amazing adventure with Bear Grylls as you learn the survival skills to stay safe in the wild and be able to cope in all situations. This festive activity book for little children is full of Christmas scenes to decorate. Dress the dolls for a Christmas market, ice skating, building a snowman and lots more. With over 200 reusable stickers of festive outfits and Christmas decorations, and a fold-out back cover so you can put spare stickers there while you dress the dolls. The ultimate book of vehicles from the creators of the bestselling Dig Dig Digging! Features over 60 jokes and rhymes, each with their own hilarious illustration - suitable for playground comedians. This title offers silly rhymes, crazy crossbreeds and a whole library of joke titles. Cosy up in the kitchen for stories and recipes by Britain's favourite baker, Nadiya Hussain, in this special World Book Day edition. Featuring discoveries of ancient Greece to Einstein via Galileo and Newton, this book takes you on a journey through time, space and beyond and find out about the physical forces that make our world. Packed with amazing illustrations and fascinating facts like why bird song is similar to human speech and what makes animals yawn, this book uncovers the amazing things your brain does while you are awake and asleep. Looks at the story of evolutionary science and the way Charles Darwin's revolutionary theories changed the world. This title shows how theories developed after Darwin, with modern scientists revealing the secrets of genes and DNA and showing what lies in the future. What makes Earth an ideal place for life to survive? In this title, the author takes kids back to Earth's beginnings showing how organisms live and survive. Packed with colourful images, facts and stats, it introduces the features and characteristics of the six main kingdoms of life. My First Coding Book: Packed with flaps and lots more to help you code without a computer! Introduces your child to the most powerful, complicated computer network that exists - their brain. From what the different parts of the brain do and why it changes at different stages in a person's life, to why sleep is so important for us, this title helps you uncover the secrets of your inner world in detail. Enables you to reduce the stress of studying science and help your children with their homework. This title covers the important areas of biology, chemistry and physics. It includes a glossary of key science terms and symbols. Why do things float? What happens to the food you eat? Suitable for school projects, this book helps you find out the answers to these and many more questions. It introduces young readers to the wonders of science. It comes with simple text, photographs and illustrations, fun science activities and exciting recommended Web sites. A fabulous, pocket-sized guide that tackles the mysteries of everyday things, from nature to science and technology. Concise text, colourful diagrams and illustrations and simple experiments to try at home combine to answer children's questions on human biology, geology, natural science, weather, magnetism and astronomy, and much more. Introduces children to the world of science. This title contains 57 activities including bubbling wizard's brew, magic flowers, panpipe straws, a spinning paper helicopter and a light catcher. It is presented with over 850 colourful stickers to decorate the projects with. Explore science in a fun new way, with a different activity or experiment for every day of the year. Hands-on science to fascinate children, with often surprising results. Will inspire the scientists of the future. 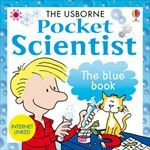 Further resources are available online via the Usborne Quicklinks website. A flap book that introduces the world of science in a simple way for younger readers. It is full of surprises to keep enquiring minds entertained, including flaps beneath flaps. It features basic science topics from how plants grow to astronomy and forces. Each double-page includes simple practical experiments for children to try themselves. Features photographs that reveal the secrets of the micro world, from algae to atoms, dust to DNA and flies' eyes to flu viruses. This title offers practical information on buying and taking care of microscopes, and over 20 step-by-step projects for use with your own microscope. Containing 100 stimulating and absorbing experiments, this innovative book brings a fresh and exciting approach to the practical world of science, combining creative arts and crafts activities with the basics of physics, chemistry and biology. An introduction to physical geography including information on the climate, volcanoes, erosion, the weather, ecosystems and humans. It is illustrated with photographs, maps, and diagrams that can capture the imagination of young readers. It also comes with internet links to recommended websites with maps, quizzes, games and homework information.